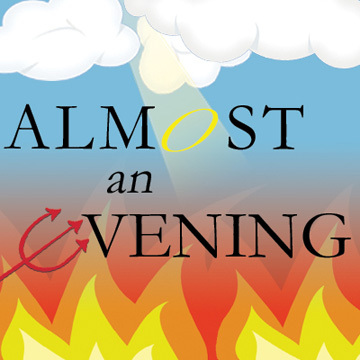 New England Premiere of "Almost An Evening"
Theatre on Fire opens its sixth season at the Charlestown Working Theater with Ethan Coen's "Almost An Evening." Performances will run from October 8 - 23. "Almost An Evening" marks Ethan Coen's first foray into the theater. The evening consists of three light plays on weighty topics. In "Waiting," a dead man waits, waits, waits...then waits some more to grab the shuttle to Heaven. In "Four Benches," a British secret agent visits steam baths and park benches on a less-than-successful journey to reinvent himself. And in "Debate," cosmic and not-so-cosmic questions are raised, although little is learned. Ethan Coen is an iconic filmmaker who is responsible, along with his brother Joel, for such films as "Blood Simple," "Raising Arizona," "The Big Lebowski," "Fargo" and "O Brother Where Art Thou." In addition to winning an Academy Award for "No Country For Old Men," the brothers have received countless other honors, awards and nominations, including BAFTAs, Golden Globes, London Critics Circle Awards, and Writers Guild of America Awards. "Almost An Evening" was first performed in a limited run at Atlantic Theatre Company's Stage 2 in New York City in 2008, before transferring Off-Broadway to The Theatres at 45 Bleecker Street. The original cast featured F. Murray Abraham, Joey Slotnick, and Mark-Linn Baker, among others. The cast of "Almost An Evening" features Kate Donnelly, Lisa Caron Driscoll, Jeff Gill, Craig Houk, Marc Harpin, and Phil Thompson, along with TOF newcomers Bryan Daley, Bill Doscher and Jorge Martinez. Theatre on Fire has been nominated for nine IRNE awards in its first five seasons, winning once for 2009's “Bash.” Now in its sixth season, Theatre on Fire is proud to be a Resident Company at the Charlestown Working Theater (CWT). Darren Evans explains: “CWT has given us a wonderful opportunity to grow and thrive. It’s a great organization, a funky facility, and a truly welcoming environment.” TOF is also a member of the Small Theatre Alliance of Boston. For tickets, call 866-811-4111 or visit www.charlestownworkingtheater.org.